Siskiyou Pink Primrose is a mounding perennial that is adorned with pastel pink blooms in midsummer. The center of the flower will fade to white giving the flowers a two-tone effect. Siskiyou Pink Primrose will grow to a height of 8-12" and 8" to 12" wide. It makes a great ground cover plant on dry sunny slopes. It has dark green foliage throughout the season. Use Siskiyou Pink Primrose for massing in a perennial bed, a low growing border, or as a ground cover. Plant in well drained soil in full sunlight as Siskiyou Pink Primrose loves the heat. It is drought tolerant once it is established and is deer resistant and a Firewise plant. It will attract butterflies when in bloom. The flowers are fragrant which tend to keep the deer away. 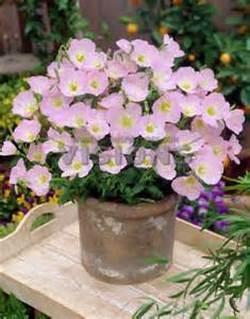 Siskiyou Pink Primrose also makes a great container plant.